I love buying CD’s and vinyls. I also download (only legally) music but nothing compares with the joy of buying a new record for my collection. It was a rainy afternoon, a few year back in London when I spotted in one of the Virgins (Virgin Megastores) a stilish CD cover which was different from all the others. Hed Kandi? Hm! I always try new stuff so I bought it immediatly. In the same afternoon I listened it on my laptop. Next thing in the morning I bought another 3 compilations and I became addicted to Hed Kandi music, spirit and its lifestyle. In 2010, I can’t wait to meet Hed Kandi in Ibiza, at Es Paradis! Es Paradis celebrates this year its 35th anniversary and is one of the places which keeps alive the pure party atmosphere which makes The White Island famous. 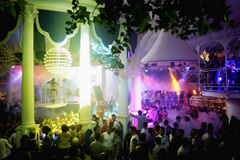 The combination between Hed Kandi and Es Paradis is perfect and Circus Balearica added that cherish from the cake for a complete entertainment atmosphere. I also like Hed Kandi’s radio show presented by Andy Norman at Ministry of Sound Radio. We are on holiday in Mallorca and it’s the perfect soundtrack for that. Enjoy Ibiza!